The Gouthro's Moose Madness 'Quick-Fix' For The Hunter is divided into seven sections, including the First Play. 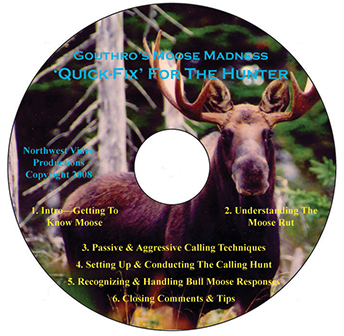 After a brief introduction this DVD provides you all essentials to understand the moose rut, learn how to call using both passive and aggressive calling techniques, learn how to set up and carry out the calling hunt, and learn how how to recognize and handle bull moose responses. It ends with some valuable tips to assist the hunter in becoming an expert moose hunter & caller, including how to handle the close 'hung-up' bull. First Play - Applicable to all Moose Madness DVDs. The First Play leads to the Chapter Menu. As indicated above, this 'Quick-Fix' production covers all the essentials for the hunter on the road to becoming a successful moose hunter. However, the original Gouthro's Moose Madness Series On Moose Hunting & Calling consisted of six hours of video. A single DVD can hold just under two hours of the same quality video, and what to include and what to leave out of this 'Quick-Fix' production was a huge challenge. While the 'Quick-Fix' Chapters cover all the essentials very well, the following topics covered in the Moose Madness Series are not covered in this 'Quick-Fix' production: 1. Moose Identification; 2. Moose Habitat; 3. Moose Survival; 4. Moose Anatomy & Shot Placement; 5. Use Of Decoys; 6. Meet The Players; 7. Alternative Method Of Field Dressing; and 8. Equipment Considerations.